Very useful in Sand Casting, Ductile Iron Casting and Grey Iron Casting. Heat calculator software contain Dongle based security. It will helps to calculate (approx) material per kg cost by considering burning lose, molding labour, rejection and profit. While calculating the per kg cost, it considers all materials put into to produce the final product. Heat calculator software will let you manage the quality and cost of the final product. 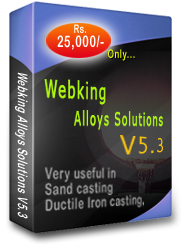 It will help you to let you client/s know the per kg alloy cost immediately. Heat calculator software allow you to deliver the product in accordance with the Indian Standard Grades that are equivalent to global grades. The software keeps all the related information with it -- with ready to access any given time – including casting, material & sub-material, party, heat and raw material. It also helps to generate various/different kinds of reports as per the clients’ requirements.